Amazon is stepping up the customer service game for users of the new Kindle Fire HDX. For those of us who might be a tad technologically challenged or for any problem that might occur, Mayday is a built in remote support and instant helpline available to the consumer 24/7/365 days a year. So if you’re confused by the predecessors and have used YouTube videos or Googled your questions for years, the new age of customer service may be setting Amazon apart from their competition. 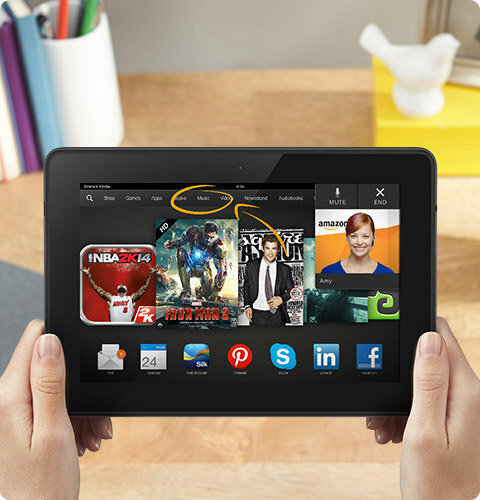 With just one button found in the tablet’s Quick Settings menu, the Kindle Fire HDX will summon an Amazon employee who is able to help solve any problems – from the simplest to perhaps the most complicated. Within 15 seconds, the Kindle owner can see the representative in a small window of their screen and the representative can even see the apps, and if necessary can draw on the Kindle to help the customer. Amazon assures us that the representative can not see us, but with the customer’s permission, can control the tablet remotely much like LogMeIn or TeamViewer. The new Kindle Fire HDX offers double the memory, is 34% lighter, and has 11 hours of battery life – especially helpful when reading one of those extraordinarily long suspense novels you just can’t put down, but putting all technological help aside, the customer service aspect is a win, win, win. Since Amazon doesn’t have the convenience of a brick and mortar store like Apple and their Apple Geniuses, this free service guarantees a place in customer service heaven for so many users over the age of 25 who weren’t weaned on iPads and tablets. Amazon states their profit margin for the sale of Kindle tablets is slim, however they admit to raking in the profits in the sale of their devices. Criticism on the downside of this customer service technology focuses on the possibility of Amazon reps having access to passwords and sensitive information. You can ask them to disable their screen however, but there are still some who are wary of security issues. It’s been said that 95% of the issues happen when devices are working as they should, but Amazon reps will be logging in every question and problem which will help to determine improvements in the future. Amazon CEO Jeff Bezos easily stands by the side of such geniuses as Steve Jobs, Bill Gates, and Larry Page. Bezos, as he rescues us from our customer frustrations, works on “customer delight.” Tech people who have tried out Mayday thus far have been pleased, but will Bezos’ promise that Christmas morning, my mother will be able to get live tech support within 15 seconds and a tech will be available to instruct my mom step by step? I guess it all remains to be seen. Not only will Amazon offer a great service, they will also make sure that their tablets work, so that they don’t have to offer the service often. « Is customer service more about loyalty or preventing frustration?